Current Pooleys UK Flight Guide -Spiral. This Microlight Pilot's Starter Kit consists of The Microlight Pilot's Handbook. CRP-8 Microlight Flight Computer. Microlight Log Book. FC-8 Pilot's Flight Bag. Pooleys Spiral United Kingdom Flight Guide (latest edition). Pooleys NM-2 Scale Ruler. Pooleys PP-1 Protractor. Pooleys CRP-1 Computer. Pooleys CB-3 Kneeboard & VFR Log Pad. Pooleys PPL Log Book. Pooleys FC-8 Case. ASA E6B FLIGHT COMPUTER (ALUMINIUM). The best slide-rule-style flight computer on the market, with solid aluminum construction and easy-to-read lettering. Nautical and statute scales are included. Vinyl case and instruction booklet included. It features a stylised airplane graphic and Boeing logo. Colourful gift box shows the full aircraft and has cutouts that provide a peek at the mug inside. Hand wash only. Not microwavable. BOEING 737 MAX Engine Mug. Pooleys CRP-1 Computer. Pooleys CB-3 Kneeboard & VFR Log Pad. Pooleys PP-1 Square Protractor. Pooleys NM-2 Scale Ruler. Pooleys Personal Flying Logbook. Pooleys EASA Part-FCL PPL(A) Syllabus & Student Record of Training. Pooleys Helicopter Manual. Pooleys CRP-1 Flight Computer. Pooleys PP-1 Protractor. Pooleys NM-2 Scale Ruler. Pooleys HB-1 Kneeboard & Log Pad. Pooleys PPL Log Book. Pooleys Spiral UK Flight Guide (latest edition). Pooleys PPL Helicopter Pilots Starter Training Kit with eBooks. Pooleys Helicopter Manual. Pooleys CRP-1 Flight Computer. Pooleys PP-1 Protractor. Pooleys NM-2 Scale Ruler. Pooleys HB-1 Kneeboard & Log Pad. Pilot Communications PA200 IK Intercom. The PA200 IK was designed for users of the ICOM A22, A-4 and the Bendix-King KX-99. The intercom has a inset slide switch on the top of the unit which allows the user to set the intercom for use with the A22 or the KX-99. Professional Pilots EASA Log Book. Flight Training. CRP-5 Flight Computer. FB-7 Flight Board. FC-7 Flight Case. This Professional Pilot's Kit consists of Compass Dividers. Scale 1:500,000 and 1:1000,000 (NM-3). This exceptional fixed wing student starter kit from Pooleys is perfect for the aspiring pilot. Pooleys NM-2 Scale Ruler. Pooleys PP-1 Protractor. Pooleys CRP-1 Computer. Pooleys CB-3 Kneeboard & VFR Log Pad. 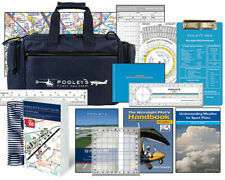 This exceptional fixed wing student starter kit from Pooleys is perfect for the aspiring pilot. Includes the very latest Pooleys spiral UK Flight Guide. Pooleys Spiral United Kingdom Flight Guide (latest edition). This exceptional fixed wing student starter kit from Pooleys is perfect for the aspiring pilot. Pooleys Helicopter Manual. Pooleys CRP-1 Flight Computer. Pooleys PP-1 Protractor. Pooleys NM-2 Scale Ruler. Pooleys Glider Pilot's Flying Log Book. Glider Pilot's Starter Kit consists of The Glider Pilot's Manual. Glider Pilot's Kneeboard. Glider Pilot's Log Pad. Pilot's Flight Bag FC-8. Understanding Flying Weather. 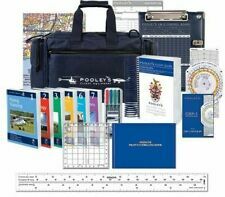 This exceptional fixed wing student starter kit from Pooleys is perfect for the aspiring pilot. Pooleys PP-1 Protractor. Microlight Pilot Handbook - Cosgrove. Microlight Log Book. FC-8 Pilots Bag. Lumcolor Permanent Pen Set. This exceptional fixed wing student starter kit from Pooleys is perfect for the aspiring pilot. Pooleys Glider Pilot's Flying Log Book. The Glider Pilot's Manual. Glider Pilot's Kneeboard. Glider Pilot's Log Pad. 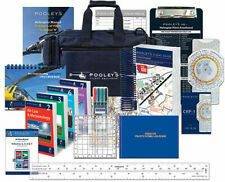 This exceptional fixed wing student starter kit from Pooleys is perfect for the aspiring pilot. Current Pooleys UK Flight Guide -Spiral. The Microlight Pilot's Handbook. CRP-8 Microlight Flight Computer. Pooleys PP-1 Protractor. Ideal for the Microlight Pilot, this basic kit includes Microlight Pilot Handbook - Cosgrove. Microlight Log Book. Lumcolor Permanent Pen Set. Air Law for Microlights - Weighell. The MyClip Thigh/Kneeboard strap is for any tablet from a 3" device up to a 10" device when the unit is NOT in a case or sleeve. The following leaflets are including in this lot I would describe these leaflets as being in a good used condition. One leaflet has heavy foxing on the front cover. 3A Winter Flying 1990. 3B Winter Flying 1997. Standard issue in flying schools throughout the UK. Previous Flying Experience. Conforms to ANO. Pilot Communications PA200 IC Intercom. The PA200 IC was designed for users of the ICOM® A2, A20, A21 Handheld Radios, this willnot work with newer ICOM radios. "The worlds smallest portable intercom". Other Flying. Record of Simulated Training. Past Experience. This exceptional fixed wing student starter kit from Pooleys is perfect for the aspiring pilot. Pooleys CRP-1 Computer. Pooleys CB-3 Kneeboard & VFR Log Pad. Pooleys PP-1 Square Protractor. Pooleys NM-2 Scale Ruler. Pilots PPL Starter Bundle. Condition is Used. Dispatched with Royal Mail Signed For® 2nd Class. Including Pooleys CRP-1 computer, Douglas combined protractor and a small Nav rule. Please ignore the part numbers, they are an auto fill from eBay! Professional Pilots EASA Log Book. This exceptional fixed wing student starter kit from Pooleys is perfect for the aspiring pilot. CRP-5 Flight Computer. FB-7 Flight Board. FC-7 Flight Case. RNP-1 Plotter. It features a stylised airplane graphic and Boeing logo. Colourful gift box shows the full aircraft and has cutouts that provide a peek at the mug inside. Hand wash only. Not microwavable. This is the CAA UK VFR Chart for the 1:500,000 area Southern England and Wales. It is Edition 45, effective from March 29, 2019 These United Kingdom 1:500,000 charts are renowned for their high quality, definition and technical content.